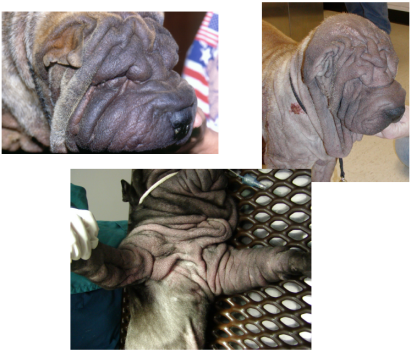 This seems to be an uncommon syndrome that I’m seeing in young Shar-Pei. These pups have excessive wrinkling and overdone heads. At some point moderate to severe itching develops with excoriations due to self-trauma the result. In addition the skin becomes excessively scaly with serum exudation drying on the surface as crusts. I suspect these individuals have excessively high levels of hyaluronan (mucin) which can lead to inflammation of the skin. In one article it was demonstrated that Shar-Pei have five fold higher levels of hyaluronan than other dog breeds. It is also known that hyaluronan (HA) can broken down into proinflammatory substances which stimulate inflammation. I have seen one set of litter mates in which one dog had this condition and the other one did not. There was a distinct difference in appearance between the two litter mates. These dogs do not respond to antibiotics, various shampoos, topical therapy, antihistamines, etc. I have had good success with tapering doses of prednisolone ending in alternate day therapy which does decrease mucin production and “deflates” the dog. Several of these individuals have seemed to outgrow this condition.